LONDON  Bob Anderson, a former Olympic swordsman who staged fights for films including the original "Star Wars" trilogy and the "Lord of the Rings," has died. He was 89. Anderson died early New Year's Day, the British Academy of Fencing said Monday. "He was truly one of our greatest fencing masters and a world-class film fight director and choreographer, and both the fencing community and film world will miss him," said the fencing academy's president Philip Bruce. Anderson's sword-fighting pupils have ranged from Errol Flynn and Johnny Depp to the cast of the "Lord of the Rings." Among his credits as a fight choreographer and fencing coach are "The Moonraker" (1958), "Kidnapped," "Barry Lyndon," "Star Wars," "Highlander," "The Princess Bride," "The Three Musketeers" (1993), "First Knight," "The Phantom," "The Mask of Zorro," "The Parent Trap," "Die Another Day," "Pirates of the Caribbean: The Curse of the Black Pearl," "Alatriste" and "The Legend of Zorro." Born in 1922 in Gosport, Hampshire, Anderson (left, in 2003) served in the Royal Marines during World War II and was Britain's Senior National Fencing Coach and former Chairman of the British Academy of Fencing. He competed in world championships and Olympic fencing competition beginning in 1952 through 1979. His first movie work was for the Errol Flynn adventure "The Master of Ballantrae" (1953), in which he staged fights and doubled for nearly every actor dueling Flynn. Given the editing of sequences in which he doubled for various performers, at one point he "killed" himself. Anderson was also an uncredited stunt double for David Prowse as Darth Vader in the light saber duels of "The Empire Strikes Back" and "Return of the Jedi." Being four inches shorter than the six-foot-five Prowse, Anderson had to wear lifts. Praising the skills of opponent Mark Hamill as Luke Skywalker, Anderson told Fencing Online of his "Empire" turn, "It's the first time I've doubled the 'baddy' and won!" 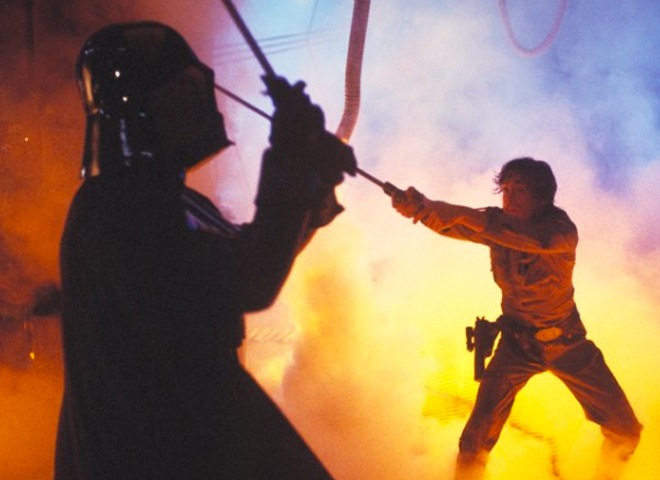 His role as Vader's double was not initially publicized, but Hamill, who played Luke Skywalker, said in a 1983 interview with Starlog magazine that "Bob Anderson was the man who actually did Vader's fighting." Anderson's other early, uncredited film work includes "Crossed Swords," "The Guns of Navarone," "From Russian With Love," and the original "Casino Royale." After retiring from the British Academy of Fencing, Anderson emigrated to Canada and became Technical Director of the Canadian Fencing Association and Chairman of the Fencing Academy of Canada. His last film work was as Sword Master for the "Lord of the Rings" prequel, "The Hobbit," due in theaters later this year.